Indoor air pollution is now listed by the Environmental Protection Agency as the fourth greatest environmental threat to Americans. When your heating and cooling system is running, airborne contaminants are being drawn into your duct system. Over a period of time, these harmful contaminants can eventually build up inside your air ducts. Indoor contaminants may include: dust mites, tobacco smoke, household mold, chemicals, airborne allergens, bacteria, animal dander and carbon monoxide. These contaminants are then circulated thoughout your home or office and can affect the health and comfort of you, your family, or your employees. 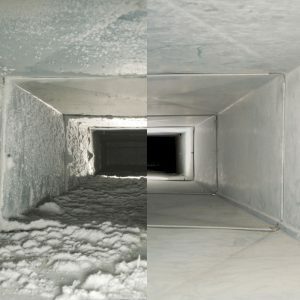 Having your air ducts cleaned can help elimate these problems. According to the EPA, indoor air is found to be up to 70 times more polluted than outdoor air. Air duct cleaning by Healthy Living Carpet & Tile can remove airborne contaminates such as bacteria, fungus, mold spores, pet dander & pollen which may help to alleviate allergy & asthma symptoms. System failures are often caused by dirt and dust, especially in Arizona. One of the functions of the fan, located inside of your air handler, is to keep the heat exchanger cool. Accumulated dirt and debris can reduce the CFM (cubic feet of air per minute) by as much as 50%. This is the most common cause of cracks in heat exchangers. By having your system cleaned, you may prevent pre-mature breakdown & aging of your heating and cooling system.